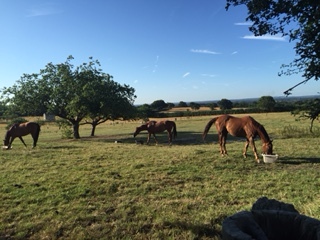 The last day of July and everything is being readied for the National Hunt horses to get back to work. 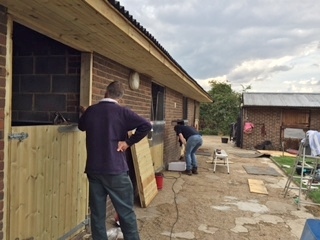 The boxes have had a makeover and a steam cleaning, while the farrier has been round to the holiday field to put their new shoes on. It may be totally different weather to what they can expect to race in, but the timetable has been set to get them to their best for their autumn/winter targets. 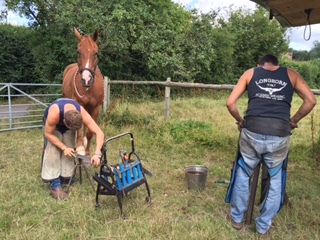 Red Anchor stands patiently as his new shoes are fitted. Sun Thing To Cheer Us Up! 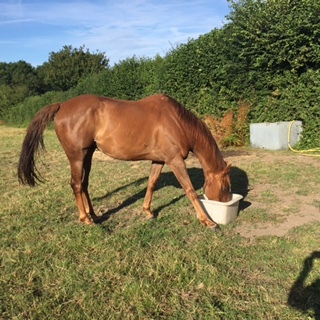 With the forecast of heavy rain and cooler temperatures over the next few days the horses in the holiday field, including Red Anchor and Itoldyou, made the most of their time in the sun today as they will be returning to the yard very soon. For them, the last of the summer wine! ﻿And by the looks of them they will need some serious work or new girths! Linda has gone to Ireland to hopefully purchase a horse or two. Two owners, Sally and Pauline, are accompanying her and very much looking forward to seeing what Ireland has to offer. 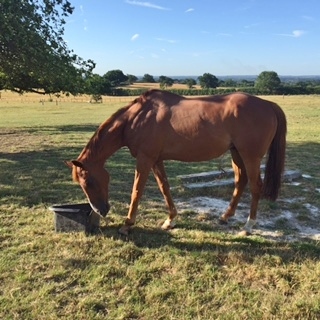 While Linda is searching generally for new blood for the yard, the three of them are looking specifically for a National Hunt horse for a newly formed syndicate. 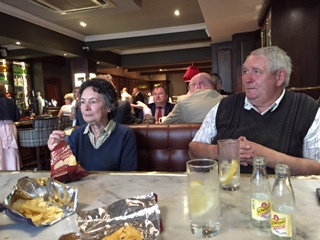 The three of them flew out from Gatwick yesterday (Wednesday) evening to meet up with Pat Jones, one of Linda's friends, who is a breeder out there. Thursday has been spent looking at horses. 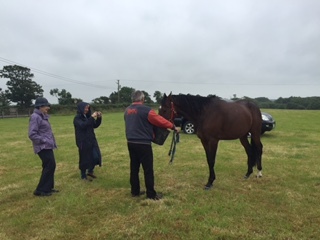 The plan for a very full day was to visit equine establishments from Clare in the east right across to Wexford in the west. Typical Irish weather made for soggy viewings. 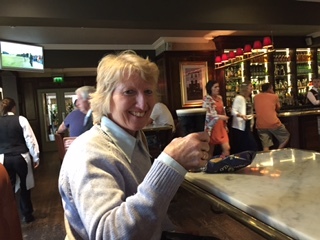 There was just time for Pauline to sample the local brew! Other refreshment had to be taken when possible to help last out the day, with the prospect of a hearty evening meal when the day's viewing and travelling were over. A couple of nice horses were seen on Thursday but no decisions made. More horses to see on Friday. 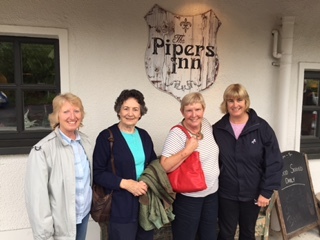 As expected they had a lovely evening meal at Pipers Inn. 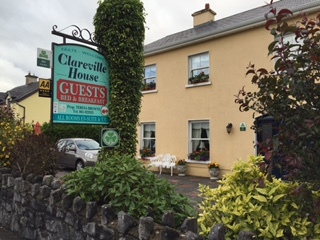 The B & B where they are staying in Tuamgraney, Scariff, has been very comfortable and Teresa Browne the proprietor has provided an excellent breakfast to get their long days started. 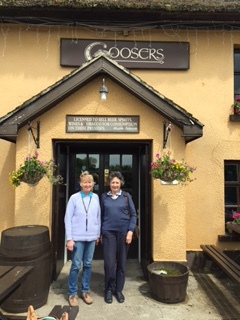 After a morning looking at horses it was a visit to the wonderful Goosers restaurant in Killaloe. 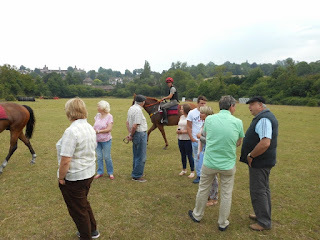 It wasn't all pubs and restaurants, there was plenty of horse viewing. 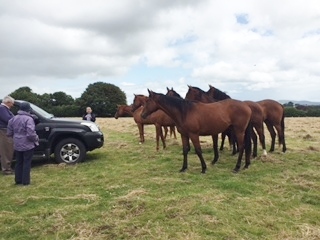 Here you can see an inspection of a field of fillies. 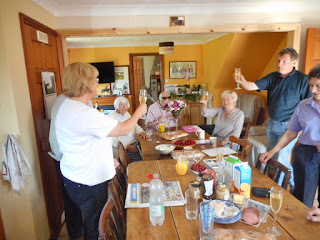 It was another champagne breakfast at the stable today, though this time it wasn't a winner being celebrated. Glasses were raised to Linda for her birthday and to the newly registered Denwood Lad, his owners and their sky blue and pink colours. It is always pleasing to welcome newcomers to racehorse ownership, so it was a jolly breakfast this morning as the family of the new owners of Denwood Lad visited for the first time. They have had the pleasure of naming the horse, to include their company name, as well as choosing their racing colours. Hopefully it won't be long before the colours are seen on the racecourse.